In India marriage is not a single day affair. It’s a process that starts from the day a girl is born. Mother collects jewellery all her life and gifts the best ones to her daughter/daughter-in-law. Before the “BIG day” of a girl’s life arrives, there are a lot many other occasions where the bride has to sizzle and look her best. Sometimes, we tend to ignore our dress and jewellery for functions like mehendi, because marriage rituals get delayed and we just quickly grab the first thing which comes in our hand for a cocktail party. Today, I am going to make your task a little easier, even if you just have 10 minutes to get ready, you would look your best. Go for danglers or drop earrings (read: how to choose right jewellery for your face shape). Earrings with diamond embellishments look expensive and reflect light which makes everyone’s head turn around for you. If you are blessed with long neck then danglers is what you are looking for. If you are a short neck beauty, then either go for earring with medium length or go for button shaped earrings embroidered with gemstone that will match with your outfit. Your necklace is the heart of your look. 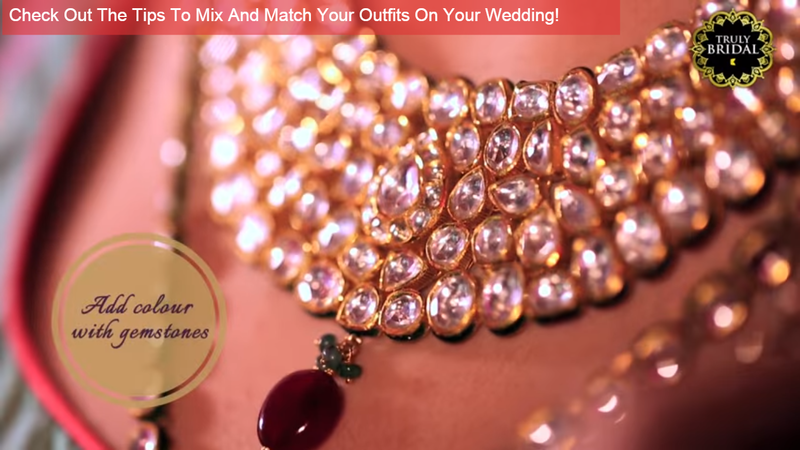 Choose a necklace wisely keeping in mind the neckline of your dress and amount of work done on your dress. Experiment with bold, chunky gemstones and bold beads (read: How to choose the right necklace for your neckline). A necklace which looks great on someone might not look great on you. The reason for this is the balance point. Take a visual measurement of your face and then mirror the length from chin to chest. This is your balance point. When you choose a necklace it should fall on your neck at this length to look the best. Because you are the bride and all your younger ones will look up to you as a fashion diva, you don’t have to load yourself with jewellery instead, wear something light and dainty. If it’s cocktail party, then go sleek using diamond studded kangans or go for gold bangles with artistic design. You can also choose multiple gold churis in one hand. You can wear a watch and some bangles together in one hand. Else just ditch the watch and shine on, only with your bangles. A cuff studded with stones is also a good idea. With your LBD, try on a beautiful anklet. It should be thin and dainty. This will make you look feminine and fragile. A thin chain anklet with a semiprecious bead looks great with a cocktail dress. If you are planning to wear Indian outfit for the party, then you can opt for payals in a variety of designs. For mehendi function if you are planning to wear a kanjiwaram silk sari then wear a kamarband over the sari. This will make your belly look beautiful. Nikita Mehra recommends that you can also wear kamarband as a belt with your LBD or any other cocktail dress. Just mix and match properly and you are all set to go. to the TrulyBridal By Kalyan Jewellers YouTube Channel.